Unlike many other sleeping aids and relevant gadgets which might not suit you all the time, Dodow may bring fruitful results due to its scientifically designed slow rhythmic light. 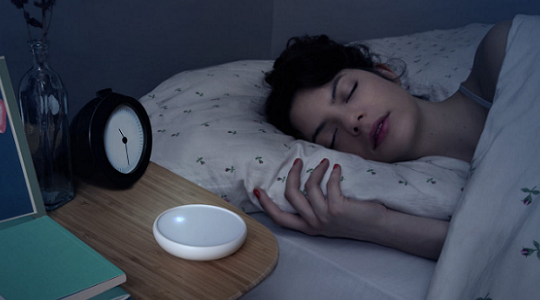 Dodow light metronome actually retrains your brain to fall asleep while it mesmerizes you to sleep. Dodow's slow rhythmic light is specially designed to quickly quiet your busy mind, slow your breathing, and relax your body and altogether making to fall asleep in shortest time. You won't need any medicine, with Dodow, a person who normally takes 60 minutes to sleep, will take no more than 25 minutes after using it. More than 150,000 people are already falling asleep with Dodow. Many who even have other difficulties such as troubled thoughts, stress, restlessness, and chronic insomnia are highly benefited after using Dodow. So stop thinking, and have a look at this amazing gadget.